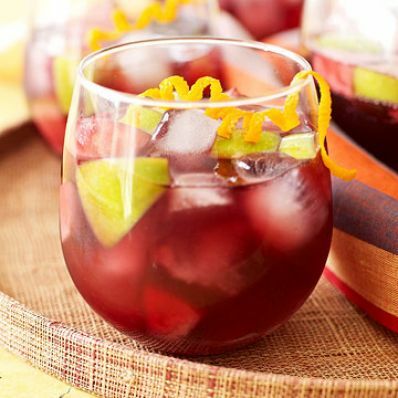 1 of 1 Combine white wine, pomegranate juice, red wine, schnapps, apple pieces and peach pieces in a large pitcher. Stir well to blend flavors. Refrigerate for at least 2 hours or overnight. Before serving, add diet soda and club soda. Serve over ice with orange curlicue garnish. Per Serving: 11 g carb., 118 kcal cal.